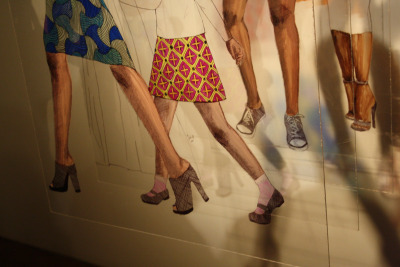 As part of the Fro Festival for Black History Month, Montreal-based Fro Foundation, the Michaelle Jean Foundation and the Montreal Museum of Fine Arts organized an exhbition entitled “The 4th Wall” that aimed to explore the Black Canadian identity. My project, m(other)nity, is a redefiniton of the concept of modernity by the Other. I wanted to examine the concept, the manner in which it intersects with race and gender and re-interpret my position within it. As a Nigerian-Canadian woman, m(other)nity becomes the ability to define oneself for oneself —to accept the inherent complexity of humanity and mankind, the existence of multiple m(other)nities that are all equally valid. I am a sister, a daughter, a student, an artist, a modern black woman and an individual. M(other)nity aims to challenge a concept that is in many ways a hegemonic cultural device and invites each individual to redefine and re-position themselves within this modern world. The project is divided in three parts. 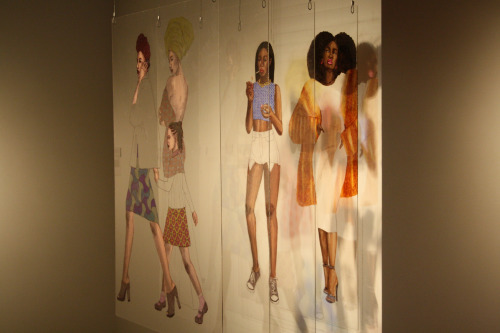 The first part consists of layered paintings on plexiglass that show different performances of black/African femininity and the manner in which they can fit into the concept of modernity. I wanted to visually depict modernity as a safe space that is created individually and encompasses separate elements that can be seen separately or as a whole. The second part is a video collaboration with Dominican filmmaker Jean Jean. Short and simple, the video highlights the complexity of a concept such as modernity —especially as the parameters of race and gender are then added. The final part is a written article entitled “The Modern Black Woman and Politics of Respectability”. Starting with a first reaction to the installation piece, I discuss the image of the black female body, the creation of a dichotomy of queen and hoe, as well as the need for a multitude of black, female narratives within the media. In starting Coloured Conversations, I knew that I wanted to collaborate with other artists, and in doing so, explore society through the intersection of different art forms. For a part of this project, I collaborated with Dominican filmmaker Jean Jean to make a short clip that highlighted the divergences and similarities in individual conceptualizations of modernity. Jean Jean graduated from the ¨Ángel Haché¨ Acting Laboratory, at the National School of Dramatic Arts, Fine Arts, in 2003. Through the Department of Documentary Direction at the EICTV, he has made several documentaries and a short film adapted from a story by Juan Bosch, entitled ¨The Woman¨. In his words : “Through the eyes of young filmmakers we will register what it means today to be human in an effort to look through the eyes of others and there to see ourselves”. We had just finished installing my piece when two women walked in. The only other occupants of the exhibition room were the artists, curators and technicians. So when the women entered, it became obvious from the perplexity written across both their faces that they had no prior knowledge of the event. The smaller of the two, slowly freeing herself from the confines of her winter wear, headed straight to my installation, stopping only when she stood directly in front of it. I watched anxiously from across the room; trying my best to read the slightest lift of an eyebrow, tilt of the head or tug of the lip. My heart lifted when her lips suddenly curled into a small smile. “I love it”, she said, turning back to beckon her friend toward the piece. “It shows all the different kinds of black women! I can relate to all of them”, she continued, voice rising as her excitement became more apparent. Her subsequent silence came as a surprise and I watched as her gaze trailed over to the third sheet of Plexiglas. In my mind’s eye I retraced the lines that I had painted onto that piece, recreating the image: a black woman standing with a cigarette dangling from her mouth, a lace top baring her midriff, shorts riding high on her waist and a pair of black converse on her feet. She took a few steps closer, going around the piece to stand right in front of the fictional character that I had created – a character that nonetheless represented one aspect of me. My heart skipped a beat and I waited with baited breath for her next words. Her eyes were still fixated on the painting as the curator made her way to the woman’s side. “That woman is ruining it for us!” she said, voice getting louder as her frustration and anger towards this one, singular representation of black womanhood rose. And all at once, I realized that I had been right to include this woman in my installation, to include her in my understanding of the modern black woman.